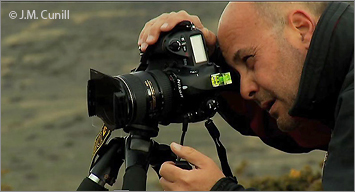 Juan Santos Navarro, biologist and nature photographer(born in Barcelona-Spain in 1964) tries to focus his photographic activity in coast, wetlands, and mountain sites close to his town, Barcelona, were a good knowledge of the field ant the seasonal properties, permits him to be more demanding in his search of the longed images. His interest about nature, that came from the infancy, lead him to penetrating into such matters as the entomology, ornithology and mountaineering ( he graduated in Biological Sciences in 1989) and his artistic worries centered on the nature: drawing and water-color, they derived towards the photography initiated the 80. He combined this activity with his habitual visits to the Pyrenees, realizing ascensions to some of his tops and performing climbing activities, at the end of the 90 and beginning of 2000, he began to realize more artistic photography, always focused on nature, and to take part, reaching the final or semi-finals in numerous occasions, in international contests like Wildlife photographer of the year, GDT or Glanzlichter. The light of certain moments (he never uses artificial light) and the colors that contributes to the natural scene, are those who allow to transmit the emotions that captivated the photographer in the moment of the accomplishment of the capture, whereas the composition is a sign of identity of the photographer, always tries to find new manners of seeing natural environment. This trip never finishes, the international influences, and some of the images of the magnificent photographers of our country always are present in his mind, and looking for new creative perceptions of the daily nature environment could be, from his point of view, one of the challenges of nature photography.